Earlier this year, Microsoft announced that they’ll be ending retail sales of Windows 7 at the end of October. But, what exactly does that mean, and is it reason for concern for anyone currently using the soon-to-be-extinct OS? As we touched on in a previous blog, operating system plays a key role in the hardware decision-making process, and Windows 7 has proved to be a reliable choice for many embedded projects. So, how does this end of life (EOL) notice impact users, and what steps do you need to take if your current or upcoming project, system or device is based on a Windows 7 architecture? What is Happening to Windows 7 at the End of October 2014? After the October 31, 2014 cutoff, Microsoft will stop providing hardware partners with copies of Windows 7 Home (Basic or Premium) and Windows 7 Ultimate. While Microsoft will continue to offer support for these expiring systems until 2020, and has not yet put an end date on the availability of Windows 7 Professional, essentially hardware buyers are now left with a choice – move to implementing Windows 7 Professional (at a significantly higher cost than Windows Embedded), migrate to the much-maligned Windows 8, or take advantage of the continued availability of the Windows Embedded Standard 7 platform. The various advantages and disadvantages of Microsoft’s Windows 8 offerings have been covered at length elsewhere, and there’s plenty of information available about what Windows 7 Pro includes, so let’s take a closer look at Windows Embedded Standard 7, its functional differences, and why it might be the optimal choice for users struggling with an OS decision in the face of Microsoft’s recent move. Windows Embedded Standard 7 (WES7) is built on the same framework as Windows 7 Ultimate, which means that any software that’s compatible with a standard Windows 7 distribution will also run properly on WES7. 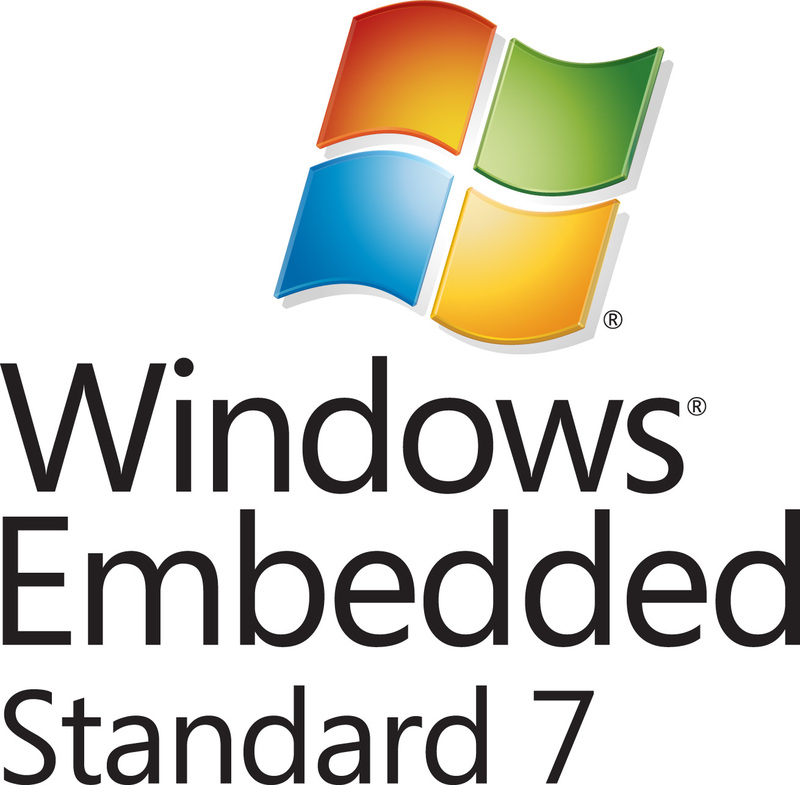 Windows Embedded Standard 7 allows users to identify the specific components of the Windows OS that their system or device requires and include only those features in the final image. In essence, Windows Embedded allows you to pick and choose the features you need in your OS and forgo those that aren’t suitable for your unique installation or dedicated appliance. The most common question we receive about Windows Embedded Stnadard 7 is how it differs from the other versions of the Windows 7 OS. The most appealing functional difference is the ability to customize Windows Embedded Standard 7 with only the applicable modules for a given project. Features normally built into the standard operating system (graphical components, drivers, applications) that aren’t needed, can be discarded. By including only what is needed, the overall image size is reduced, leaving more space for application-specific programs and files. 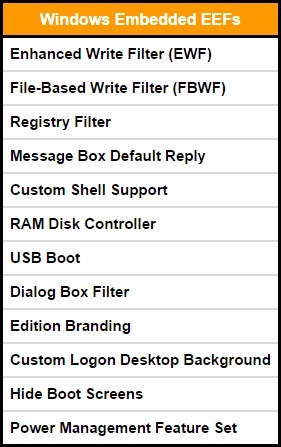 Users can also define their own custom-branded boot screens and have the ability to auto-run custom application on startup, creating a user interface and experience unique to that device. In addition to its ease of customization, the final image is considerably easier to deploy. Here at Logic Supply, we can upload a custom Windows Embedded image to our network and easily deploy that image on multiple systems before they’re shipped to clients. This creates a turn-key solution that’s ready to implement right out of the box. In the case of other Windows 7 versions, users are often required to enter their own product key to activate the OS once their systems arrive. Perhaps most importantly for embedded device development, WES7 also includes additional Embedded Enabling Features (EEFs) that offer capabilities unique to the embedded variant of Windows 7. These additional features are designed to help integrators create a custom image that’s perfectly suited to their unique application. Special write filters prevent direct access to the memory, prolonging flash storage life and preventing files from being modified. The system can be set to boot directly from a saved hyberfil.sys file, reducing system boot times. Windows Embedded Standard 7 allows users to assign Message Box Default Replies, which will automatically log and react to message boxes with “OK” or “Cancel” to ensure uninterrupted operation. Similar features can also be activated to respond to program dialog boxes. Finally, Windows Embedded Standard 7 offers users a significant cost savings over the only other remaining W7 version available, Windows 7 Professional. Users implementing Windows 7 Embedded can save more than $30 per license, which adds up to significant savings in deployments that can involve hundreds of systems. If Windows Embedded Standard 7 sounds like a good fit for your project, now is the time to get started building your ideal OS. Our OS development specialists can help walk you through the process of creating the embedded operating system image that best suits your unique device or installation. Contact us today at +1-802-861-2300 or fill out our simple online form to have one of our OS experts contact you for details about your project. I am developing a customized system for my client. I am using java as the platform of our development. My question is whether WES support Java as well? Thanks for the question. Windows Embedded supports the same software as Windows Standard, including Java. If you have any other questions please don’t hesitate to reach out to us at info@logicsupply.com or use our on-site chat feature to speak with one of our Solutions Specialists. We have installed Windows 7 Profesional over Wyse T10 under VMware and found that terminal does not support Skype connectors (Microphone and Headset). Do you think this can be solved with WES7? Hi Alfredo, that’s not an issue that we’ve run into before, but in general we wouldn’t expect to see a difference in compatibility with the embedded OS vs the Professional version. i have a windows embedded system, which we can’t connect it to Domain server, we have contacted the supplier which mentioned clearly, WE DON’T allow our device to connect to Network Domain Server. is there any way to connect this embedded system to the Domain. I have Windows Vista on my PC. Can I install Windows Embedded 7 standard or 8.1 Industry Pro with Update on my PC ? Will it affect my current softwares? Hi Balwinder, we would recommend doing a fresh OS install if you would like to use a different OS than the version currently installed on your system. I want to use Windows Embedded for my customized system, but I am expecting that the use won’t allow to enter in Windows so I want to run my application only and windows is hide and run in background so user is not allow to or not able to see Windows. Is this possible in Windows Embedded. Hi Gireesh, thank you for your question. The short answer is yes, this is definitely possible in Windows Embedded. We have many clients who do something similar to what you’re proposing, limiting front-end access to the OS while still allowing users to interact with their custom application. The ins and outs of implementation will vary on a case by case basis, but this is certainly possible using Windows Embedded. Good day Sir, I have an evos cell imaging system that run a custom imagine software on wes7. The system recently crashed. The company said we should send the system to them. But its difficult to send from Nigeria to us. we successfully install an evaluation copy of wes7 but when run the application on wes7 it reported that pgr driver DLL could not load. What can we do to run the application from desktop icon successfully. Before the crash the app run automatically on start up. At my work we have an windows image that has been customised for our system, I have to buy some windows licences for when I install the iso on new machines. I’d rather just go for the cheaper option. 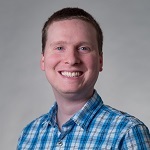 Hi Ben, licenses for embedded systems can only be used on an embedded, single task system. You should use the version of the OS that matches the version you pulled the iso from. You can check the version by going to Start > My Computer (right Click) > Properties or go to Control Panel > System. Hey Derek! This is a great article. I ran into WES7 when looking for a low-resource windows installation for netbook PCs, and WES sounds great. I’m really needing an installation that is lightweight and resource efficient, but also is secure and not vulnerable in the case that it is necessary to connect it to the internet. Do you think WES would suit these needs? It’s a much more consumer-oriented approach, as opposed to simply operating on a terminal or what say you. Thanks for the kind words Manny, we’re glad you found the article helpful. As to your question about using an embedded OS on a netbook, while it sounds like WES7 would offer the functionality you’re looking for, embedded operating system licenses are most commonly only made available through OEMs to install on their own hardware, so sourcing and installing the OS yourself would be challenging. i am new to windows platform, i have small set of doubts related to windows 7 and windows embedded 7 . 1. Can i install the windows embedded 7 in the general purpose PC’s. (like i have PC running with windows 7 professional,can i format it and install the windows embedded 7 ). 2. The drivers which are provided by third party vendors will work on windows embedded 7 , same drivers for both the windows 7 and windows embedded 7. (like edge port serial to USB converters). 3. any additional certification required for drivers to install in windows embedded 7 ? is there a version for 2010 in windows embedded standard? Hi Satish, thanks for your question. Do you mean Windows 10? There was no Windows release in 2010. For Windows 10 Microsoft changed the way they do embedded operating systems. The “embedded” version of Windows 10 is called Windows IoT. We wrote a blog about this topic which you can find here: http://www.logicsupply.com/explore/io-hub/windows-embedded-is-dead-long-live-windows-iot/. Windows Embedded can be installed on any system, but the licensing model is designed for purpose-built devices and is most commonly pre-installed by the device OEM. Many peripherals will work but you’ll need to check with the third party manufacturer to confirm compatibility. Drivers should not require any additional certification, but again that will depend on the particular peripherals/drivers being installed. Why do Windows Embedded come with an Admin password I dont know and make it impossible to open the laptop? Hi Terje, while we can’t speak to your specific issue since we don’t work with consumer systems, it might be worth trying the default Windows Embedded Administration password which is “User”. The default account name is “Administrator”. Hope that helps. we are working on a POS software for retailers and hospitality service providers. do you advice us to move to implement our solution with embeded OS. also we am most install the software on POS terminals. Hi Khaled, thank’s for your question. You decision to implement on a given OS will largely depend on your requirements and desired functionality. I can say that many of our point of sale clients do utilize an embedded OS to allow them to pick and choose only the particular applications and features they need in the final image. hi can you tell me USB filter is in windows 10 IoT if not so why? Hi Vashu, thank you for the question. USB filter is a feature in Windows 10 IoT. You can find more information here: https://msdn.microsoft.com/en-us/library/dn449350%28v=winembedded.82%29.aspx?f=255&MSPPError=-2147217396. While that post is about Windows 8.1 we’ve verified that it applies to Windows 10 IoT as well. Hi everyone, I have a query. I am running a test environment for VDI solution. I have some old PCs and laptops on which I want to access my VDI. but my requirement is not to use them as Soft Client but rather change hem to Thin Clients by installing embedded OS in it. So I want to know if windows 7 Embedded is supported on Desktop and Laptops? or if anyone knows any other OS which can convert my PC/ Laptop to a thin Client please let me know. I will appreciate your support. Hi Rashid, thanks for your question. Windows Embedded is not designed to be used as a thin client operating system, it’s simply a paired down version of Windows and isn’t optimized for virtualization. To set up your thin clients you could look into a DIY PXE server such as this – http://www.ccboot.com/pxe-boot-server.htm. Of course you could also investigate hardware designed for use as thin clients out of the box like our ThinManager line (https://www.logicsupply.com/products/by-application/industrial-thin-clients/), but it sounds like you want to use the hardware you already have. hi sir could you tell me ..can I use all windows embedded os like WES ,FES ,CE and win10 IoT enterprise for java or .net programming. Currently i have Windows XP Embedded running on one of my device and the device configuration is 512MB RAM, 2GB Hard disk, LV Celeron 650 MHz Processor. Is it possible to change the OS from Windows XP to Windows 7 Embedded on this device considering the above device configuration? If yes, is there any trial version available for Windows 7 Embedded to try out. Hi, We have developed with Windows 7 Embedded with many of our machines are across the world. What we are seeing now is that they are now being connected to the company networks as part of monitoring its performance etc. However now the machines are being attacked by Malware and the Wannacry virus. How can we protect this without destroying the embedded system installed.? Hi John, thank you for your question. Your particular security needs will vary, but installing antivirus/antimalware software is always a good idea on any system, embedded OS-based and otherwise. Murali, thank you for your question. Based on the system specs you’ve provided, we would expect you may run into performance issues when attempting to move to Windows 7 Embedded from XP. As for trial versions of Win Embedded, that particular OS is usually installed by the OEM rather than available for install by the user. Can I use Windows Embedded Standard 7 for my home PC and reduce the OS features for -speed up performance and getting close to real time for specific task or its not very different from windows 7? Hossein, thank you for reaching out. Windows Embedded is typically installed by the manufacturer onto OEM devices before shipping to clients rather than being installed after the fact by individual users. As for performance, Windows Embedded might provide incremental performance improvements, but it will vary widely based on your particular application and resource demands. Situation: I made an image of a Windows Embedded Pos Ready/Ind Pro Retail machine that’s working fine. The reason I do it is because of an exact machine I have (POS) wherefrom the mSATA disk crashed. I placed this image on the crashed machine, now it works fine again. Problem: what about the windows licence? Can I enter it somewhere in the registry?? ?